on the T-16 and T-25 give a dry 1-disc constantly closed type clutch. The mechanism of the clutch based on the following - dry between two surfaces of a flywheel and pressure plate springs clamped slave disk with friction linings which have a large coefficient of friction. 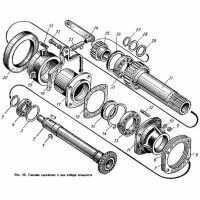 The friction forces are formed under the action of springs between the driving surface and the driven disk, thereby allowing torque transmission from the engine to the drive plate and the driven shaft of the clutch and then to the tractor GP. Provided off clutch driven plate is released from the spring force and the return rotation of the motor to the GP is stopped. design feature clutch T-25 can distinguish the presence of the 2nd power flow from the engine through a flywheel and clutch cover the driving gear pump GS. When the engine power is always transferred to the hydraulic pump, regardless of the position of the clutch. This is because the rotation of the gear passes the friction surface.